All three of the cashers from last night were Skillz Series regulars, as NumbBono took first, PinkyStinky took second, and nzgreen edged out PirateLawyer for 3rd in Limit Hold'em. Next Tuesday is 7 Card Stud (Hi Only). Hope to see you all there! Tonight's game is Limit Hold'em. This one has special significance for me, as I am thinking about playing the Limit Hold'em tournament this year at the World Series of Poker, depending on which weekend the Blogger Weekend is this summer. That's right, I actually plan on making it this year. Just a little bit of poker last night, but it was a doozy of a night for me. Played both the Tuckfard Opens. In the no limit variety, I had a strong open table for myself, and easily made the final table with near the top in chips. I fluctuated some as I was outdrawn or outplayed a little at the final table, but just kept banging away and got my first Blogger tournament win of the year. The Omaha Hi/Lo I basically luck boxed my way into 3rd place for a little bit of cash, getting the nice draws and fading other people outs for a couple of hours before my KKxx was pushed into AAxx with almost no chips left for me. NYRambler (host of the great NYRambler series on Monday nights! - which is HORSE next week), ran over the final table in taking down the 3rd Skillz game tournamnet of the year. I watched and could see he was literally going Bounty Hunting last night. Great turnout again, with 20 players. 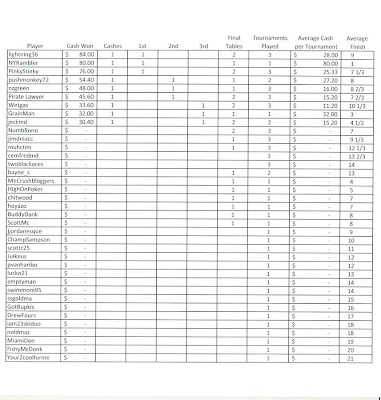 Trying a new look for the leaderboard, which until I can figure out how to drop a spreadsheet directly into Blogger, I will have to print it, scan it back in as a picture and then add that. Please give me your input on how you think it looks, and suggested changes. Next Tueday is Limit Hold'em. I will have a posting this weekend about my live poker tournament I am attending on Friday night. Skillz Game Tonight - Limit H.O.R.S.E. Still early in the year, plenty of time for anyone to jump on the leaderboard and try keep Pirate Lawyer and Lightning36 from leading all year. I will be there giving it my best shot! Sorry about the late posting, the entire family has had the flu and I am just getting over it now. This week's game is Pot Limit Omaha Hi Only. My laptop at home that I use to play poker has now officially died. I had actually just ordered my new laptop, but it won't be here for another week. I hope to still be able to play tonight (borrowing a laptop), but if not, my chips are there for the taking. Good luck to everyone, hope to see you at the tables tonight, if not, I will work on getting results posted, and maybe a little posting this week about poker tactics that I have seen and how I think they work. 1. To actually win the Skillz Game once this year. While I originally started playing pokwer when I was younger, and thus played very little No Limit Hold 'em, now I play it almost exclusively, even at home game. I want to increase my skill base, and winning the tournament I was lucky enough to get to take over as host of is part of that. 2. Provide a more informative leaderboard for the Skillz Game. 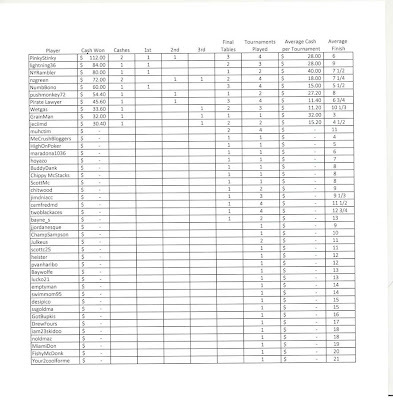 This one is actually doable, I just need to figure out how to post/imbed PDF or Excel files into a blog post. 3. Double my current bankrolls on the three sites I have money one. With PokerStars that may be interesting, as I have very little ($27.00), so a few bad SnG's and I am playing freerolls to bring my bankroll back up. With Full Tilt, I will need to start cashing more in the Skillz Game, and if the rumors of the BBT4 are true, cash in some of those too. Bodog I have almost halfway done this already, as I started 2009 with just under $350.00, and with one tournament played on there I already have a $150 cash. 5. Attend the Summer Blogger gathering. There is no way with my work schedule in December, the Holidays, and now my daughters Birthday, that I will EVER get to attend a Winter gathering, so I am already working to making the Summer gathering a reality. 6. Play in a WSOP Prelim event. This would tie in with the Summer gathering, and I hope that I can either run my Bodog bankroll up high enough to cash out of pay for it, or win a Bracelet Race on Full Tilt. 7. Post/Read more in the 67Suited Forum, that at times lately between home life and blogging, I have not been able to participate as much as I would like. 8. Post more then just Skillz Game information. More informative posts about something that I have done well, or poorly, so I can share information and get feedback from the rest of you will be a great thing for me to do this year. Well there they are. Somebody remind me not to go back and read this unless I have a good year this year at the tables. 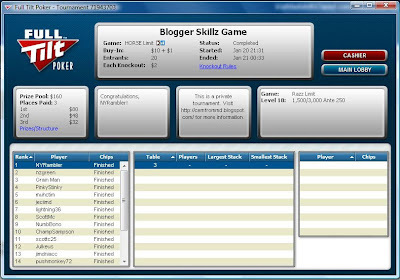 Skillz Game Results - 7 Card Stud Hi/Lo PLUS more Bodog!! Very nice turnout last night, with the usual suspects finishing near the top. Lightning36 started the year off with a bang winning the event, Pushmonkey72 finishing 2nd, and Wetgas 3rd. Last years money leader Pirate Lawyer finished 5th. "Career" leaderboard (meaning since I took over the Skillz Game), will be shown at the end of each month. On the Bodog front, I got a chance due to bad weather to sign up in time for the $1.5K Turbo, which I finished 4th in last time I played it. Nothing like a tournament that starts at 7:50 PM and is done (at least from me) just a minute before the start of the Skillz Game at 9:30 PM. My finish this time? ANOTHER 4th PLACE!! One of my goals is to win that tournament sometime this year. It still amazes me that with just the Bodonkey touranments and playing the $1.5K Turbo, I have managed to run $40 to just under $500. Happy New Year. This is the chance for someone other the Pirate Lawyer to be at the top of the leaderboard. Who will step up? Or will PL show up and win this one to be in the lead out of the gate?